A seasonal winter holiday cocktail--fresh grapefruit blended in a margarita and finished with a splash of pomegranate juice. It's tart and refreshing while using the fruits of the season. 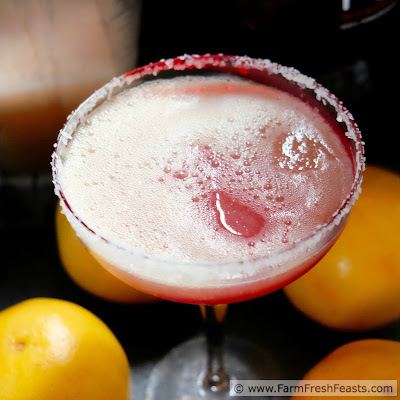 I had an idea to try a winter holiday version of my Cheater Margarita Smoothie using some of the Band Fruit Fundraiser grapefruit. It stands to reason that grapefruit and lime, both being tart citrus fruits, ought to play nicely together. On a whim I picked up a bottle of pomegranate juice and decided to add a splash of that for color (and additional tartness). I really liked the result. 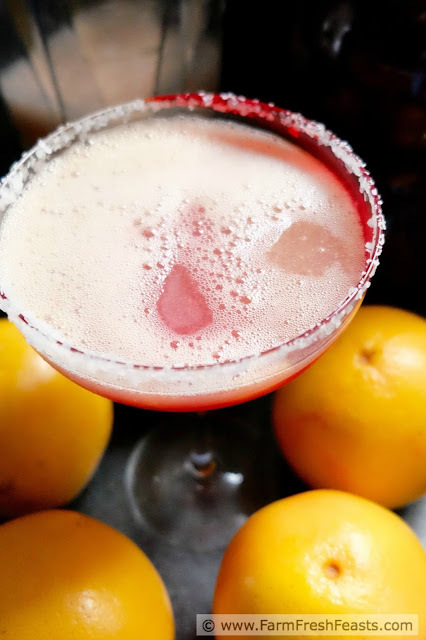 Then my friend gave me a margarita glass for my birthday (because my friends rock) and I decided I'd throw the recipe up on the blog while grapefruit and pomegranates are still in season and did some day drinking to have good light for the photos. Oh, the things I do to provide free recipes using seasonal ingredients! Unfortunately for my photos, but fortunately for me, a friend called to tell me the good news of her impending move back here and I pretty much lost the light. I'm sharing the recipe anyway, and if I feel like taking more photos I will. In the past I have put up a Year In Review post (please enjoy last year's post and the 2013 post) and then taken time off over the holidays. This year will be a little different--I enjoy sharing muffin recipes and participating in Muffin Monday, which happens the last Monday of the month, so I will be back to share a muffin recipe on December 28th. I'm not sure if it will be Oatmeal Raisin Cookie Butter Muffins or something citrus-y that has yet to be made. When I have the mental energy I'll assemble a year in Review post. But for now, because I'm still recovering from (and sharing around social media) #ChristmasWeek -- have you entered the $800 Amazon gift card giveaway? There's still time -- for now, though, please join me in raising a glass to celebrate the season. The brand names are visible--I bought them myself. No sponsorship involved. In a capable blender (I use my 14 yr old Vitamix) combine the grapefruit, margarita mix and ice. Start on low power to break up the fruit, then slowly advance the speed to high until the ice is crushed. Let's pause and talk about rim salting. I've had this with a plain rim and a salted rim. I do like the salt with the tartness of the drink, but it was a bit too salty for me. I'll try it with a sugared rim next. 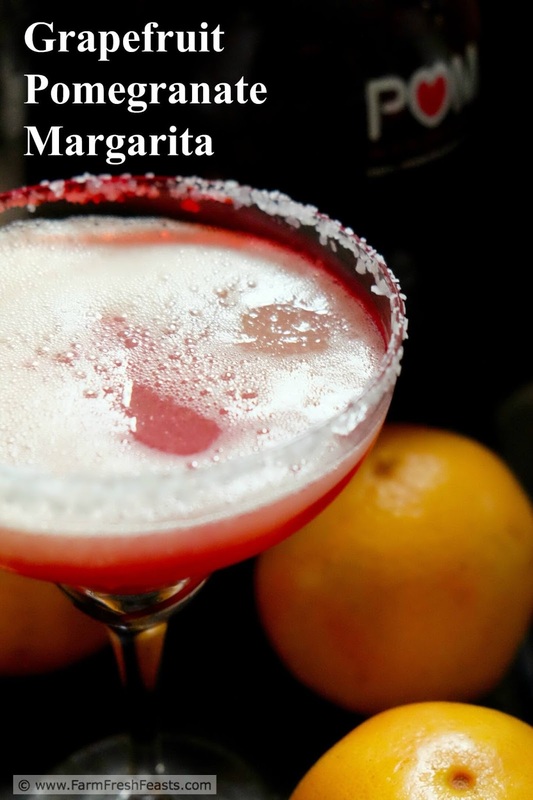 Pour into a glass with or without the rim accoutrements of your choice--I did not use spell check for that word BTW--and add a splash of pomegranate juice on top. Kippis! Skål! Enjoy your holiday! For other recipes using grapefruits, please see my Grapefruit Recipes Collection. It's part of the Visual Recipe Index by Ingredient, a resource for folks like me who wonder what to do with all of the grapefruit from the Band Fruit Fundraiser. Here's another recipe resource for lots of citrus fruits. Follow me on Pinterest, on Instagram, and my FB page. Want to know How to Use This Blog? Great minds think alike. 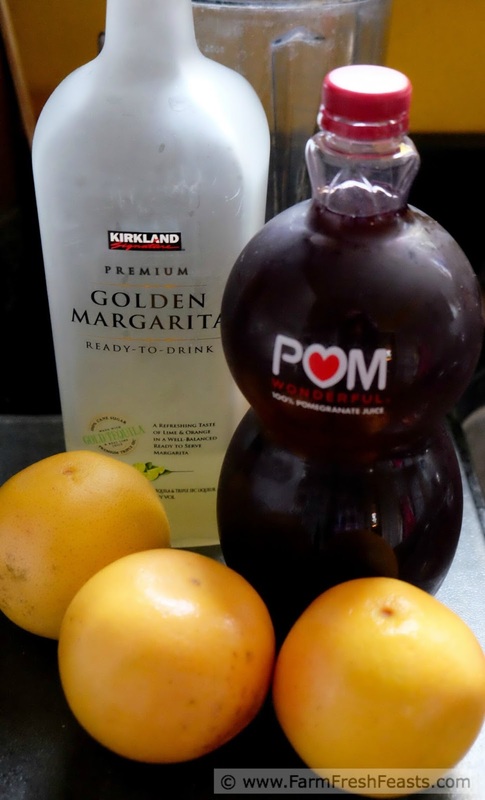 While I skip the blender, and go for "rocks," I've been drinking grapefruit pomegranate margs all week, even on school nights. It's the holidays!! Most especially on school nights, I'd say! It's never too early, depending on what's on your schedule for the day in terms of productivity, needing to drive, etc. Aww, shucks! Thanks! I find between the tea and smoothies and lemon water and margaritas I'm drinking a lot of my day. Might as well get some practice in taking photos, you know? Sounds like I would love it! I would also love it if you would link this up to Tipsy Tuesday at Grey is the New Black! It's funny, I was over at your site checking out your cocktail and thinking 'hey, for once I've got something to link up'!